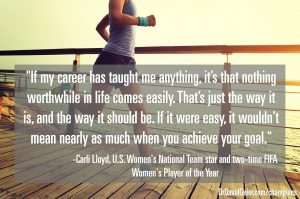 Carli Lloyd capped an unbelievable run at the 2015 FIFA Women’s World Cup, helping the Americans bring home the trophy and winning the title of best player at the tournament. This was years after actually being cut from the national team. How did she go from one of her lowest moments to becoming the best female soccer player in the world? Determination and hard work. Carli Lloyd and her trainer, James Galanis, worked together for years. As most would expect a great coach would do, he pushed his star player really hard, imploring her to be the best player she could be. But Lloyd also was determined to be the best on her own. And she proved it every day with her training. When traveling with the national team, Carli often snuck away for extra runs or weightlifting sessions. She would work for hours on shooting or conditioning when other players were resting. She wanted to be faster than the other players and excel when everyone else was getting tired. Nothing exemplified her determination more than the fact that she trained on Christmas mornings. Even on the biggest holiday of the year, she was committed to putting in the work she needed to be the best player on the field in every game. In fact, minutes after the World Cup final, she called Galanis to ask when they could start training again. How committed are you to greatness? Do you go the extra mile to improve at what you do. As I discuss in the video above, this mentality of working harder than anyone else to improve can make you the best athlete, student or businesswoman. You just have to commit and work hard on achieving your goals every single day to become a Champion in Sports, Business and Life. Note: Each week, I share stories from some of the best athletes, coaches, and trainers in the world. These sports lessons aren’t just helpful on the field or court. They can teach you to excel as a leader and a champion in business and in life. If you have friends or family who would appreciate these lessons, please share this article with them. If you would like to receive more of these articles, sign up for my Champions in Sports, Business and Life email list. Ready to win in every aspect of your life? I’ve created a checklist of 12 qualities of the world’s best athletes and coaches that will help you win in your work and life. If you adopt these traits, you will succeed in every aspect of your life, every single day. For this book and other books for Champions in Sports, Business and Life, click here to go to Dr. David Geier’s Amazon Influencer store! Episode 381: How can we prevent muscle loss as we get older?